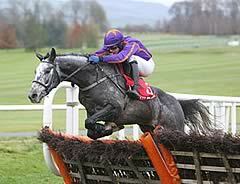 Diakali took full advantage of the absence of Our Conor to win the AES Champion Four Year Old Hurdle at Punchestown. Having seen the rear end of Dessie Hughes's Triumph Hurdle winner the last twice, the Willie Mullins-trained grey made every yard of the running to give Ruby Walsh another winner at the big meeting. Sent off the even-money favourite, Diakali looked vulnerable turning in as his three stablemates queued up behind him, but Walsh had plenty up his sleeve when Blood Cotil attacked at the final flight and scored by two lengths, with Dogora in third and Djakadam fourth as the Mullins horses filled the first four places. The trainer said: "He's a horse who can be a bit hard on himself, but he jumped well today. "We've a lot more work to do at home to teach him to settle, but the hood certainly helped today. He's very keen, but I think there's a lot more to come if we can get him to settle properly."